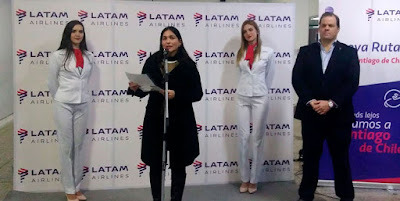 LATAM Airlines has launched a new flight from launched flights from Cuzco, Peru’s seventh most populous city to the capital of Chile, Santiago, this week. The flight started yesterday and is being operated by one of the carriers Airbus A319's configured with 144 seats. The Santiago route becomes the carriers first international route from Cuzco, although it offers seven domestic destinations. LATAM will offer three non-stop flights per week between the two cities, which may be increased in future should demand require it. According to recent research, an estimated 61,100 people travelled indirectly between Cuzco and Santiago during 2017, with most people changing planes in Lima.